Air pollution in Hanoi has become worse in the past few days. As of 3.30 pm on January 27, the air quality at 10 monitoring stations of the Department of Natural Resources and Environment stayed at orange alert which is unhealthy for sensitive people. Since the air quality index is from 100 to 200, sensitive groups should reduce prolonged exertion. If the index is from 201 to 300, the general public is also advised to avoid prolonged exertion. The index at the station on Pham Van Dong Street was 240. It was 238 on Hang Dau Street and 201 in Tan Mai Ward, Hoang Mai District. The best quality index measured was 177 in Tay Mo Commune, Nam Tu Liem District. 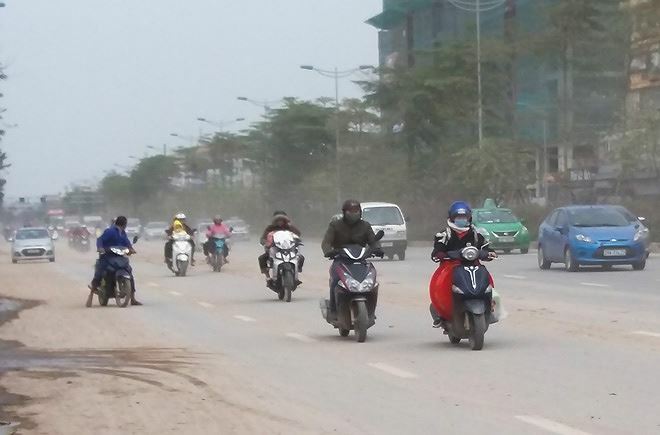 Previous reports show that Hanoi often has one or two days with hazardous level quality every year. On average, January 25 is the day with worst air quality. Hoang Duong Tung, chairman of Vietnam Clean Air Partnership, said the fine particulate matter level in Hanoi also increased sharply and it was worrisome. Fine particulate matter is mostly made up of sulphate and nitrate particles. It can penetrate the respiratory system and cause cancer. Meanwhile, regular masks can hardly provide any protection against fine particulate matter. According to Tung, the surge in the number of vehicles as Tet nears is one of the reasons or worsening air quality. The temperature inversion may be the other cause. The layer of cool air at the surface is overlain by a layer of warmer air and pollutants are trapped. Tung said the wind direction, temperature, humidity in the past days had caused the phenomenon and citizens should follow the reports about air quality. During a review meeting held by the Ministry of Natural Resources and Environment, Hanoi Chairman Nguyen Duc Chung had raised concerns over worsening air quality. He blamed the traffic and the huge amount of on-going constructions in the city.